Israeli and Iranian officials Monday indicated a cease-fire might be possible, leading to a halt in the week-long fighting between Israel and Hezbollah and left portions of Lebanon in ruins. However, Israel wants Hezbollah first to pull back from the Israel-Lebanon border and release two soldiers it captured last week, while Hezbollah wants the cease-fire first and then talk with international mediators about an exchange of prisoners. A senior Israeli official said Prime Minister Ehud Olmert had conveyed Israel's position to Italy's prime minister, who is trying to broker a cease-fire deal. Israel had previously demanded the full dismantling of Hezbollah as a condition for ending hostilities. However, the senior official said Israel would agree to Hezbollah merely leaving the border area with the Lebanese army taking its place. Meanwhile, Hezbollah-backer Iran said Monday that a cease-fire and a prisoner exchange would be possible. "We believe that we should think of an acceptable and fair (deal) to resolve this," Foreign Minister Manouchehr Mottaki said after talks with Syrian Vice-President Farouk al-Sharaa in Damascus. "In fact, there can be a cease-fire followed by a prisoner swap." Iran and Syria are the principal sponsors of Hezbollah, and the two countries have applauded Hezbollah's capture of two Israeli soldiers, which triggered the Israeli offensive in Lebanon that has killed nearly 200 Lebanese, most civilians, and wounded more than 400 others. Israeli ground forces briefly entered southern Lebanon Monday to attack Hezbollah bases on the border, as they have been doing for several days. Fighter bombers continued to pummel Lebanese infrastructure Monday, setting Beirut's port ablaze and hitting a Hezbollah stronghold in attacks that killed at least 17 people. 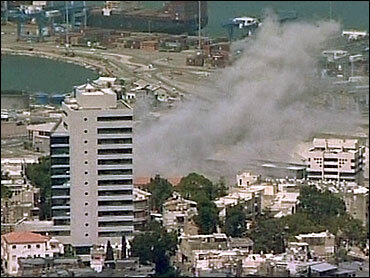 "The bombs started earlier than usual this morning, at about 6 a.m.," said CBS News' Kristin Gillespie in Beirut. An Israeli soldier was killed during a raid in the West Bank town of Nablus when Palestinians detonated a bomb, reports CBS News correspondent Robert Berger. The army says it has information that militants in Nablus are planning suicide bombings in Israel. A suspected bomber was caught Monday in Jerusalem. A senior U.N. envoy said Monday he will present Israel with "concrete ideas" to end the fighting after meeting with Lebanon's prime minister. But Vijay Nambiar, U.N. Secretary-General Kofi Annan's special political adviser, warned that "much diplomatic work needs to be done." He said he will go to Israel shortly and was optimistic about his peace efforts. "We have made some promising first efforts on the way forward," he said. "We believe that we should think of an acceptable and fair (deal) to resolve this," Iranian Foreign Minister Manouchehr Mottaki said after meeting with Syrian Vice President Farouk al-Sharaa in Damascus. "In fact, there can be a cease-fire followed by a prisoner swap." Although Israelis tell CBS News chief foreign correspondent Lara Logan the attacks on Haifa are like attacks on San Francisco would be to Americans, Mayor Yona Yahav tells Logan it's not unexpected. "We are patient, we are strong, and we can take it." Meanwhile, the very first American citizens were air-lifted to safety Sunday night. The 21 Americans, all college students, went to Cyprus on a Marine helicopter and another small group was expected to travel that way Monday. It will be Tuesday at the earliest before large scale evacuations can begin, reports CBS News national security correspondent David Martin. Then, a Greek commercial vessel, the Orient Queen, with capacity to carry 750 passengers, will be under U.S. charter and available to ferry evacuees from Lebanon to Cyprus. A Greek cruise ship chartered by French government was due to arrive Lebanon Monday to evacuate 900 French and 300 other European nationals to Cyprus, reports CBS News correspondent Elaine Cobbe in Paris. French ambassador Hadelin de la Tour du Pin said he had received assurances from Israeli government that the ship would receive safe passage to Lebanon and then to Cyprus.